Rural renovators often choose restoration projects based on their beautiful countryside setting, as they offer an idyllic escape from hectic urban life. But you may feel like you have to compromise and sacrifice some of the conveniences of modern living – such as being able to cook on gas. However, if your dream renovation project is off the mains gas grid and uses an oil-fired or electric system, there is a way you can have a gas supply to your kitchen – using LPG. LPG systems offer all the convenience and versatility of mains gas, allowing you to not only heat your home but also cook with an instant controllable flame. This is a far more desirable option than standard electric hobs, which are notorious for taking a long time to heat up and offer little control over the temperature. With LPG, you also have the additional reassurance that you can still cook in the event of a power cut. 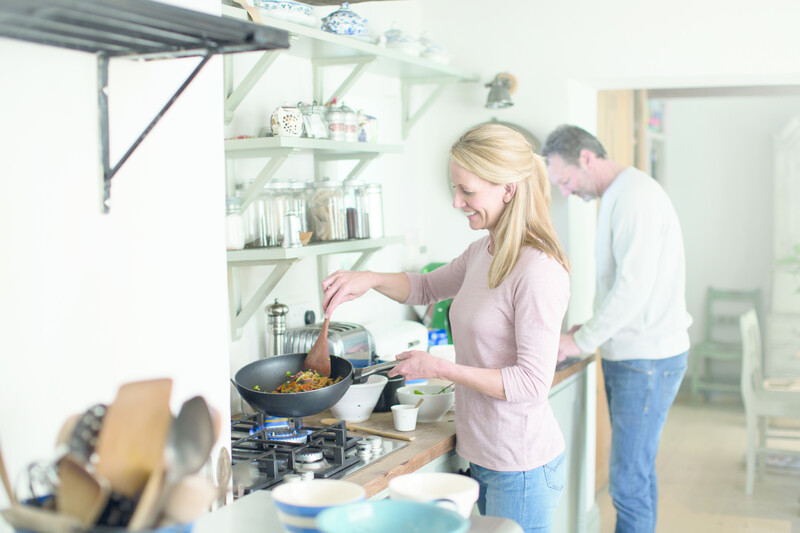 There is a wide range of LPG cookers available to fit in with the style and décor of your kitchen; whether you’re after an AGA for a rustic country feel, or a modern range cooker for a contemporary design, there are options to suit every home. LPG cookers are virtually the same as those that use mains gas, so you’ll find them familiar in design and functionality – a real benefit when it comes to the final fit. What’s more, if you don’t want to switch the whole heating system to LPG, a small cylinder supply can be discreetly installed just for cooking. Cylinders are housed outside too, so they won’t take up valuable space in the kitchen. There’s no risk of running out of gas, as Calor bulk tanks are fitted with clever telemetry systems that automatically schedules deliveries. As long as the driver can gain access to the tank, there’s no need for you to stay in either. So if you’re renovating ‘off-grid’, don’t feel that you’re restricted when it comes to fuel options for cooking – with LPG you can cook on gas, with a controllable real flame, just like the top chefs. For more information on Calor LPG and to find our about their latest offers, visit www.calor.co.uk or call 0800 181 4523. Next Post Code for Sustainable Homes and Building Regulation requirements.